Nov 14, 2018: The Tata Ace XL is quite identical to the Ace Gold when it comes to the features. It is quite a sedated mini pickup on its power with just a 0.7-litre engine which churn out 16 bhp of maximum power and 39 Nm of torque. This is mated to a small 4-speed gearbox, which clearly lacks the fifth gear. However, this Ace XL does attribute quite a good value for the company and the customers. It was launched in the country in July 2017 as a result of the growing competition from Mahindra. Though the maximum payload capacity is 710 kilograms, the rear deck is longer than the Gold so that the customers can fit in more of the goods on it. It also features power steering, unlike some others in the lineup. The Tata Ace has been up in the market for a really long time and was first launched in the country back in 2005. It is one of the entry-level pickup mini vans in the segment and serves the small cargo and freight movement companies. The Ace XL is one of the many variants of the “Chotta Hathi” and has a BS IV compliant engine. The company registers strong sales numbers for the Ace branding as a whole and the Ace XL is one of the vital contributors. It has a very competitive price tag, which is the reason why it is one of the best selling sub-one tonne truck in the country. The Tata Ace XL competes directly against the likes of the Ashok Leyland Dost and Maruti Suzuki Super Carry. The Tata Ace XL has a similar engine setup as the standard Ace. This means, there is the same 0.7-litre two-cylinder engine that complies with the BS-IV norms. The motor is good enough to make a maximum power of 16 bhp that comes at 3,200 rpm and a peak torque of 39 Nm, coming at 2,000 rpm. The churned out power is sent to the wheels through a four-speed gearbox. The power is good enough to take the truck to a maximum speed of 60 kmph. That, along with a decent amount of torque makes sure that the cargo load on the deck can be easily carried. The Tata Ace XL looks exactly identical to the standard Ace. However, there is just a minor graphics and the moniker that marks it different. It has a very compact half body that is built on the chassis. There is a D+1 day cabin on the chassis too. However, this particular variant of the truck is longer than the standard Ace and Ace Gold. The overall length is around 4.07 metres, while the total height is 1,845 mm. The wheelbase is pretty healthy at 2,250 mm, which makes the handling better. The mini truck has a gross vehicle weight of 1,630 kilograms, which also includes a maximum payload of 710 kilograms. This means the kerb weight stands at 920 kilograms. The Tata Ace XL lacks the convenience of a power steering. However, considering that the vehicle isn’t very heavy, handling turns out to be easier than otherwise. It is compact in size and can be driven easily without worrying much about the long length at all. As for the suspension, it has a different setup for each of its axles. The front axle has the Parabolic leaf spring with anti-roll bars while the rear has the similar Parabolic leaf units but with live axle. The suspension is quite apt for driving on all kind of roads, be it the off-beaten path or normal city. The Tata Ace XL has a pretty sedated set up for the braking. However, the unit is quite apt for the size and weight. The front wheels get disc brakes while the rear has drum units with dual circuit hydraulic. Through the rear clearly lacks feedback, the firmness of the front brakes compensates for it pretty well. Safety-wise, there is the standard mini van-like setup. The disc/drum setup is attached with parking brakes, which comes in very handy while parking it in a light gradient area. The lack of ABS does not affect much as the power and weight aren’t that high. Seat belts are given for both the occupants inside the cabin. 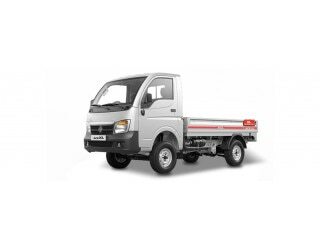 The Tata Ace XL has the standard deck body with medium overhangs. The deck is long enough to accommodate quite a lot of payload capacity. However, the addition of power steering for the driver would have made things more convenient. Barring that, there is a driver’s information display and telematics for the tech bits. The driver’s seat can be adjusted to get the ergonomics to be on the comfortable side. However, just like most other truck in this price segment, it lacks air conditioning too.